Bees: they’ve had a tough couple of years. Between the mysterious Colony Collapse Disorder and pesticide poisoning, the Department of Agriculture recently estimated that around ten million hives have been lost over the past seven years. What’s to be done? Short of giving bees the keys to your winter home or, more realistically, banning pesticides altogether, ecologists are trying to build better habitats for bees—like this one in Buffalo, New York. 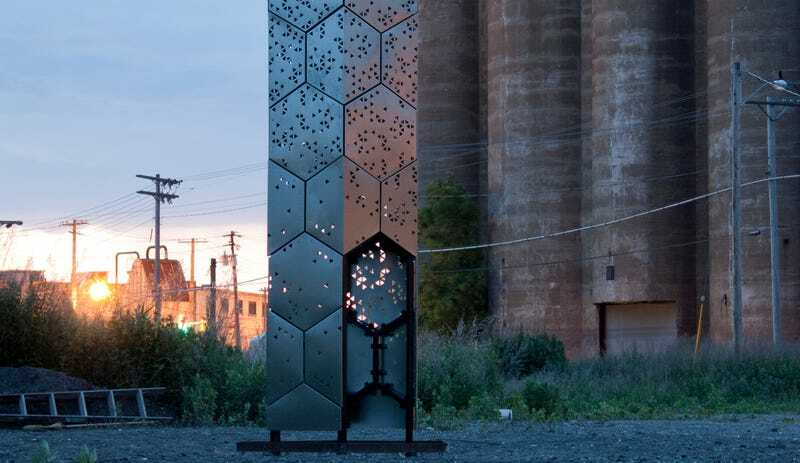 Built by students at University of Buffalo’s School of Architecture and Planning and Department of Architecture’s Ecological Practices Research Group, Elevator B is 22-foot-tall hive designed to nurture the bee population in Buffalo. It sparks children to learn and adults to reconsider what they thought they knew. This includes the designers themselves, who have not only designed for the needs of their clients but have become inspired to become advocates for them as well. This actually isn’t University of Buffalo’s first wildlife tower. In 2010, students built a bat tower to nurture the city’s bat population, which has dwindled thanks to White Nose Syndrome, a mysterious phenomenon that appeared in 2006—which strangely, is the same year Colony Collapse Disorder was first documented. There’s no concrete evidence that either tower combats CCD or White Nose Syndrome, but one thing is certain: they’ve helped raise awareness about both phenomena, which is a big part of finding a solution.